Spitfire Mk. 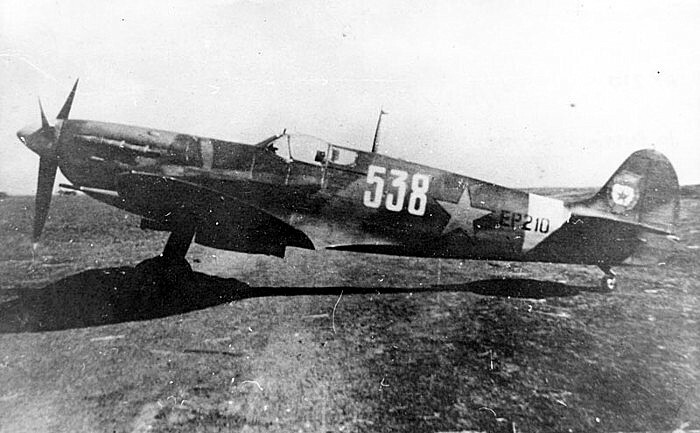 Vb in the markings of the Soviet 3rd Squadron, 57th Guards IAP (Istrebitelnyi Aviatsionnyi Polk – Fighter Aviation Regiment) at the time of the battle of Kuban bridgehead, 1943. EP210 was manufactured in Castle Bromwich in June 1942, after which it was sent to maintenance units 9 and 82. Since October 23, it was loaded in crates onboard a ship to Basra in Iraq together with other Mk. Vs of the first lend-lease shipment of the Spitfires to the Soviet Union. The first batch of 35 aircraft was received by the VVS in early February 1943. and by the end of March the delivery of 143 Spitfires was completed. 57th GIAP converted to the Spitfire and entered battle at the Kuban front on 27 April. While the unit enjoyed some success against German Bf 109Fs, the attrition of equipment was extremely high and the Spitfire’s operational career with 57th GIAP lasted only about five weeks. By 1 June the regiment was left with only six aircraft, of which only 4 were serviceable. Subsequently, the unit re-equipped with P-39 Airacobras, for which there was no shortage of spare parts or replenishment aircraft.